Understand that, in normal conditions, water can exist in three different states. Compare solids, liquids, and gases in terms of having a fixed shape or volume. Describe the phase changes that occur when heat is added to or removed from water. Compare the structure, spacing, and motion of molecules in solids, liquids, and gases. Students use images to explain what happens to water during a phase change. Use this graphical organizer as a way to check student understanding of the Gizmo's phases of matter conc... (more)epts before they do the Gizmo's Assessment Questions. 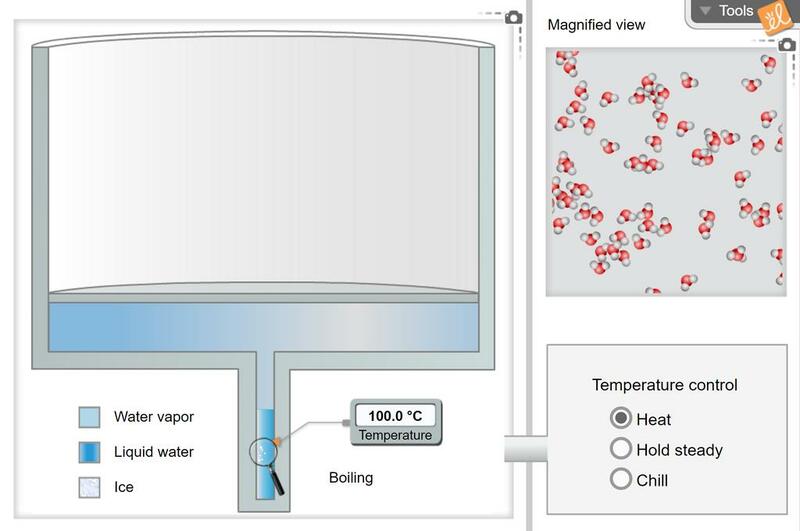 This quiz can be used after students understand matter as a solid, liquid, and gas. Useful for States of Matter, Changes in state vs. temp, Particulate model, Phase Changes! Modeling things too small to be seen. I did this as a co-taught lesson with a teammate, our fifth graders LOVED it! It takes 2-3 45 minute blocks, but all the kids were engaged! Great Introductory Activity for the Phases of Water. Clearly demonstrates solids, liquids, and gases! Great way for students to see states of matter. This was helpful in seeing the states of matter and how molecules move.